Mastin Labs is a photography software company in Seattle, WA. They make photography presets for Adobe Lightroom CC and Photoshop CC to make your digital photos look like film. 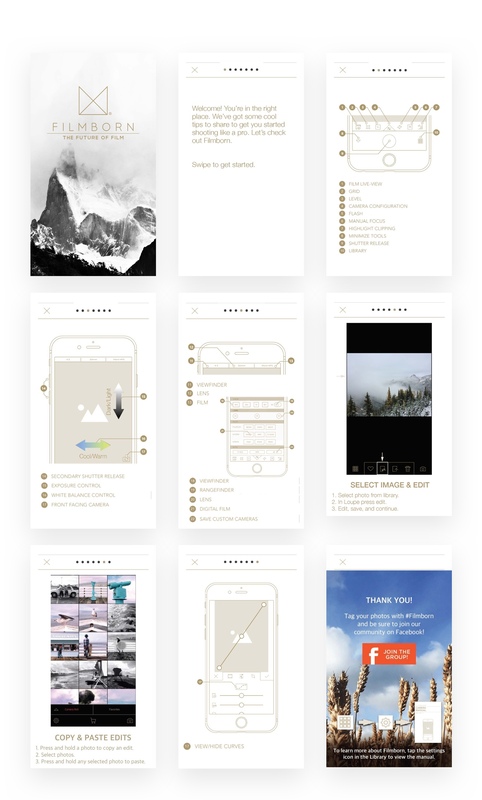 Filmborn is their iOS app that brings those presets to iPhone photography. Filmborn is intended to achieve user retention. We have observed that the app isn’t meeting user retention goals for Mastin Labs which is causing users to leave and is effecting business. Our goal is to improve Filmborn so that our customers are more successful based on Mixpanel, Reviews, App Downloads, Star Rating, and iTunes Connect User Retention numbers. My role was UX Consultant; conducted research, data analysis, prototyping, design, usability testing. The team also included the CEO, Creative Director, and Developers. User data from Mixpanel, heuristic analysis details from onboarding, and user feedback in camera view helped to shape our prototypes for further testing. I made a hypothesis about users accessing the library to go to the settings and camera manual based on user data from Mixpanel. I proved my hypothesis wrong when I dug deeper into Mixpanel funnels and found users were going to open photo albums and edit photos instead of going to the camera manual. This was a great learning experience that caused me to pivot and focus more on editing and interactions in the library. I analyzed data, conducted user interviews and designed a streamlined onboarding experience with the team to improve user education and retention. Mixpanel data insights showed me that either the Library is a very important part of many (18k+) user journeys or a user need is not being met through the current app navigation. This is where I started to ask questions. Where are they going? What are they doing? What are user goals associated with clicking the library? How could we possibly simplify journeys, use Mixpanel to measure what works, learn from it, and adjust to make user journeys more delightful. By giving users a voice sooner in the process we focused on learning which features have the biggest impact on users. 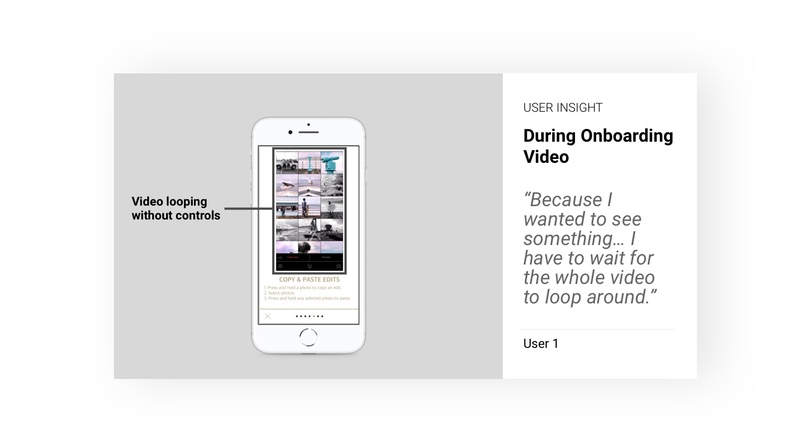 Due to high cognitive load from videos and text, both users tested did not know how to white balance when asked after completing the onboarding tutorial. They had to go back into the settings and look through the getting started or user manual to find out more details. Our approach to problems were to analyze user journey data, conduct heuristic analysis, conduct competitive analysis, and develop prototypes based on the synthesis of those in addition to user data and interviews. User data showed us that users who completed certain tasks first in app had a higher retention rate over a month time period. We focused on user education for these tasks in the onboarding prototype to guide user success in app and hopefully higher retention rates after the next update as a result. As we compiled prototypes and tested we also incorporated user feedback with each new version of the prototype. While interviewing users and gathering information for the Mastin Labs team I developed two personas. “Selfie Sammy” and “Photog Phil” both have unique skill sets and are highly sought after users for the team. 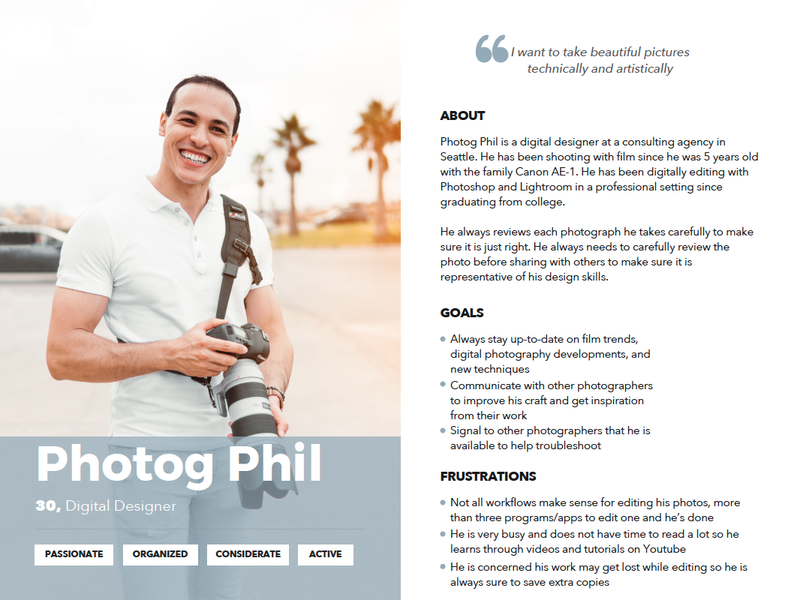 One piece of information that came from a highly technical skilled photographer during a user interview was that she believed the app was targeted toward photographers because of the technical language used for editing in app and during the onboarding. 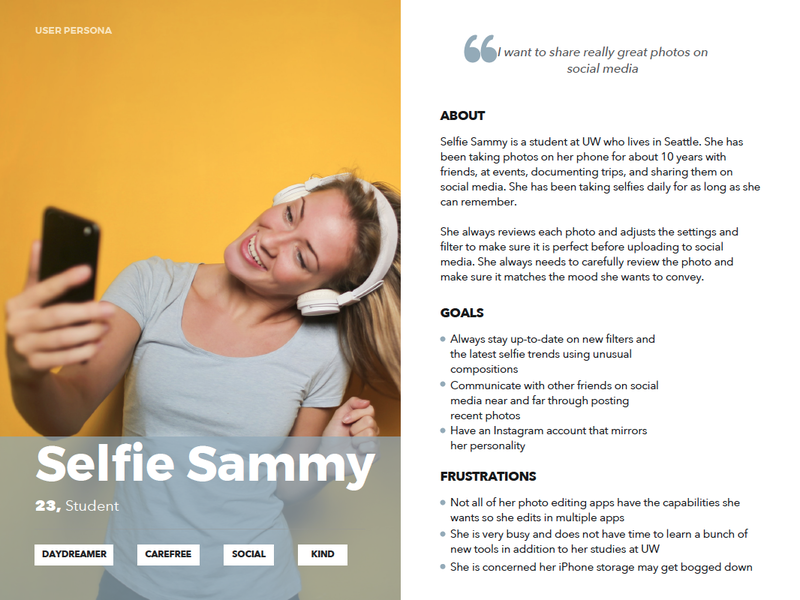 This was a challenge I brought to the team to work to create an app store and in app onboarding experience that fit the unique needs of both “Selfie Sammy” and “Photog Phil” to better set them up for success and retain them as users. Selfie Sammy just went on vacation and took a bunch of cool beach pictures. She wants to share her photos on social media but needs to edit them. Sammy heard about Filmborn from a friend, downloads via the app store on her iPhone, and successfully edits her photos to share on social media. Photog Phil uses his DSLR to shoot but it is too bulky to take everywhere. He also uses over 8 different types of software to edit his images in post to achieve the results he wants for each photo. He heard about Filmborn’s “zero-click edit” and tries by setting up a camera kit and shooting a picture with a live-view of his edit results. Phil shares his zero-click edited image in the Filmborn Facebook group and gets 1,500 likes in the first hour! One of the most important goals Mastin Labs had for Filmborn was to target which features have the biggest impact on users. Through our persona development we were able to capture what power users and new users wanted to gain from Filmborn. Power photography users wanted to continue to build on their photography knowledge while emulating film photography on iPhone with Filmborn. 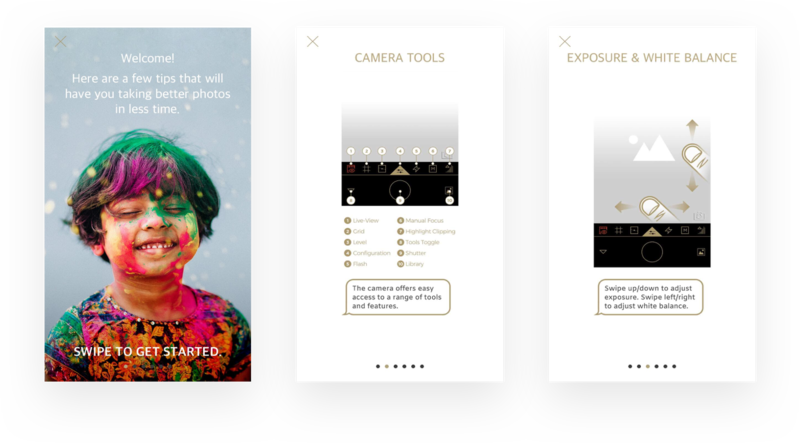 New novice photography users wanted to learn about photography, editing, and emulating film photography on iPhone with Filmborn. Where these two overlapped we found the core experience and built the new and improved onboarding experience for users of all abilities. With the CEO and Creative Director we decided to target the core experience where power users and casual users overlap similar to competitors such as FaceTune and VSCO. I learned so much about conducting user interviews during this 5-week sprint. I learned that it is important to give users a voice sooner in the process in order to make adjustments to better meet their needs with the MVP. I learned a lot about the correlation between data and user behavior. I also learned how to quickly test and make adjustments according to user feedback with each prototype iteration in order to keep the prototype and progress moving forward. The first version of onboarding uses images from the manual to orient the user along with part of the original onboarding to copy and paste edits. Overall feedback from users was this onboarding contained too much text and some of the numbering may be confusing. Initial onboarding user testing showed where more information or visual indication of features are needed: exposure, and white balance. Need to eliminate explanations for viewfinder, lens, and film. Need to include how to start editing from selected photo in library to loupe. Through the process of elimination, the user was able to figure this out on his own but said it would be nice to know going into the app how to start editing right away. Through testing version 1 I identified the need to show steps to get to manual visually; library, settings, camera manual. This is a lot more information than I initially planned to put into onboarding, but the user seemed very excited to know what all of the icons were in camera after going through onboarding. He tapped through to play with all in camera. He did go back into the manual to find out more about white balancing and camera kits. Here the added cool/warm and dark/light indicators show white balance and exposure, eliminated explanations for viewfinder, lens, and film and combined these within camera settings. Added how to start editing from library selection in loupe. 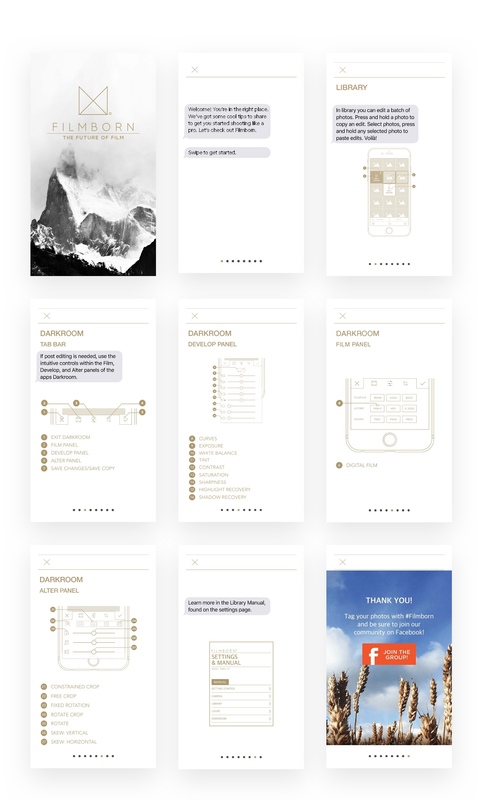 Added visual indications to get to the manual. I also exchanged Curves for Camera Kit. Added a title to every panel, identifying what part of the app is being presented. In your deck, the third, fourth, and fifth panels would all be titled CAMERA. Panel six would be titled LOUPE, and so on. Removed the visuals showing the status bar from panel five. This information is not critical to taking a photo or editing. 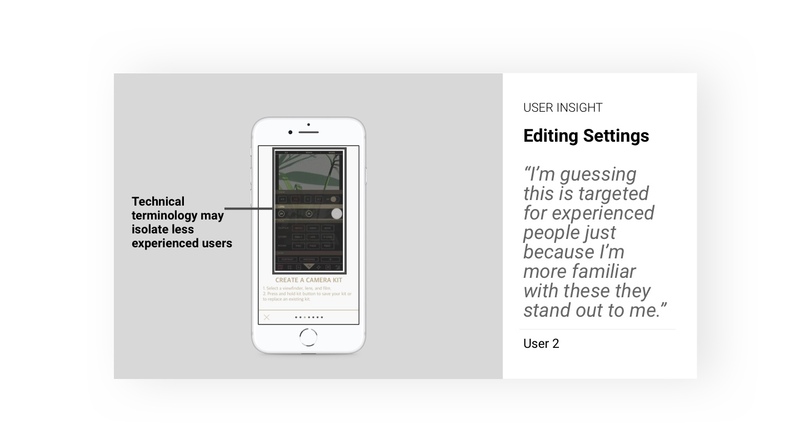 I don’t want a user to see anything in onboarding that might mislead them about what they need to focus on to take and or edit a photo. Moved the Copy/Paste panel before the Loupe panel appears. You have the Loupe panel specifically addressing editing a photo; having the copy/paste instructions immediately following that may unintentionally imply that copy/paste is somehow part of the darkroom editing experience. If the primary focus on the Loupe panel is going to be accessing the darkroom (editing a photo), then the panels that follow should walk the user through each of the three areas of the darkroom, or at the very least, a single panel should identify the darkroom and label each of the three sections. I added the second to last panel be dedicated to highlighting the full app manual. The final panel should only promote joining the Facebook Community. More than one user mentioned contextual tips for walking through the panels, what to call attention to, why they are looking at it, etc. I added iMessage bubbles in version 4 to match real-world conventions for contextual tips. The progress indicator bar is shifted back to the bottom of the panel for consistency. At this point I was looking for other progress bars because 10 indicator units is a lot and may be overwhelming to users as they check their status. In version 5 I tested according to recent discoveries about user retention. Higher overall retention rates were indicated for users who white balance or edit a photo as their first action in app versus a user who pressed the shutter as their first action. Testing for version 5 A and B were positive overall with the first actions a user took within the app. The user tested with version A immediately went to white balance their photo. The user tested with version B went to edit photo in the library as their first action in app. In version 6 I added back panels about batch editing and editing in the dark room to check for understanding with users. Ultimately we found the most important screens were: welcome, camera tools, exposure & white balance, dark room navigation, learn more, and join the Facebook community. 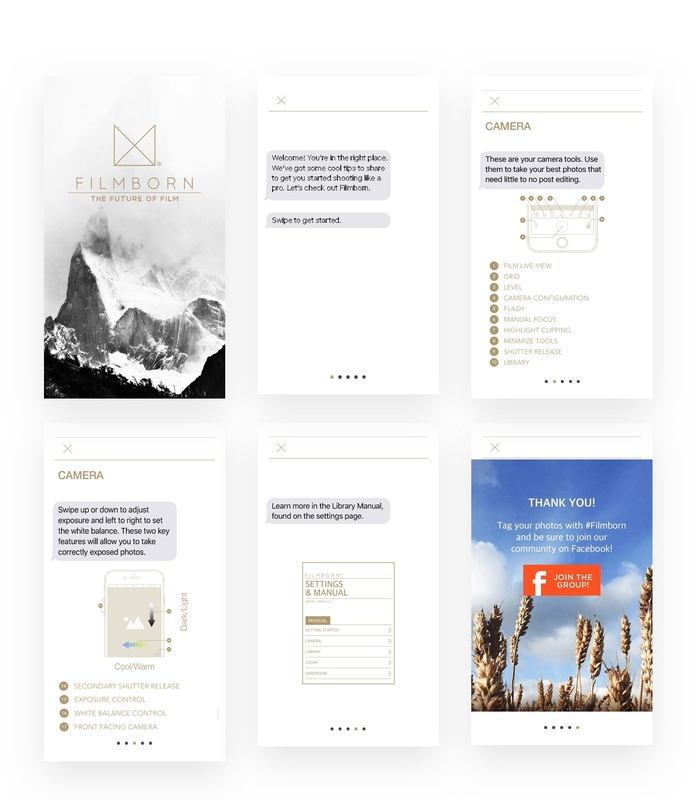 The work concluded with a working prototype used to test with users and then inform onboarding in the latest Filmborn update version 1.4. As of 12/4/18, the iOS app update1.4 including all of my UX work has been developed, was approved by Apple, and released to the public. 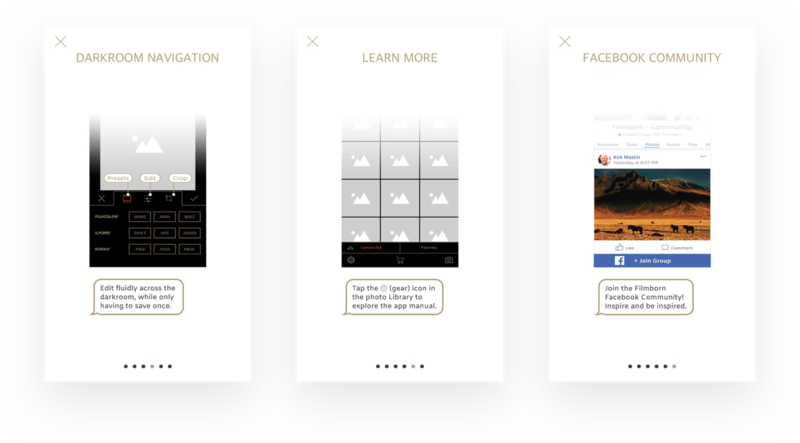 Below is the updated onboarding experience to improve app education for users and increase user retention. The App Store updates and improved onboarding have resulted in a 300% sales increase over the first month after release along with increased retention growth. Video of the final onboarding released in the App Store as Filmborn V1.4. 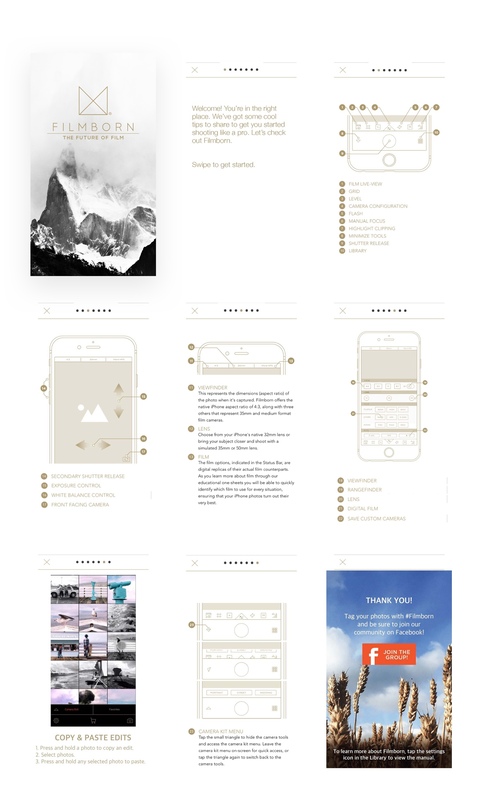 I collaborated with the Creative Director to create this polished onboarding at the end of our 5-week sprint. Since this was only a 5-week sprint I have many more ideas for the future. In the future I would continue to monitor user data to make data-driven decisions to best meet the core experience for users of all abilities. I would add some interaction learning experiences to the onboarding process to solidify user learning of the editing gestures for white balancing and exposure adjustments.